Published Jun 29, 2015 by Prentice Hall. Part of the LiveLessons series. In this lesson, the participant gets an overview of the different Ubuntu products. It gives insight in the desktop editions, the server editions, and the availability of support and updates. In this lesson, the participant learns how to install Ubuntu Server. Best Practice guidelines are provided for the installation process. This lesson is about common Ubuntu Server Administration tasks. It gives a high-speed introduction to essential server management tasks, including working with sudo, editing text files, managing users, and managing permissions. This lesson gives an introduction to networking and remote access. It explains how network configuration is managed on Ubuntu Server, and how Ubuntu Server is configured for use in IPv4 networks. It also explains how to configure SSH to allow for remote access. This lesson provides an introduction in Ubuntu Server software management. Course participants will learn how to work with the dpkg as well as apt utilities. In this lesson the participant learns how partitions, logical volumes, and file systems play a role in Ubuntu Server. Creating new partitions is explained, as well as managing Logical Volumes and file systems. On a server, many services need to be started and processes need to be managed. This lesson teaches how to configure services for automatic starting during boot. It also explains how to manage processes on Ubuntu Server. The Apache web server is the single most commonly used service on Ubuntu Server. This lesson teaches how to install Apache on Ubuntu Server, and how to configure it to host different websites. 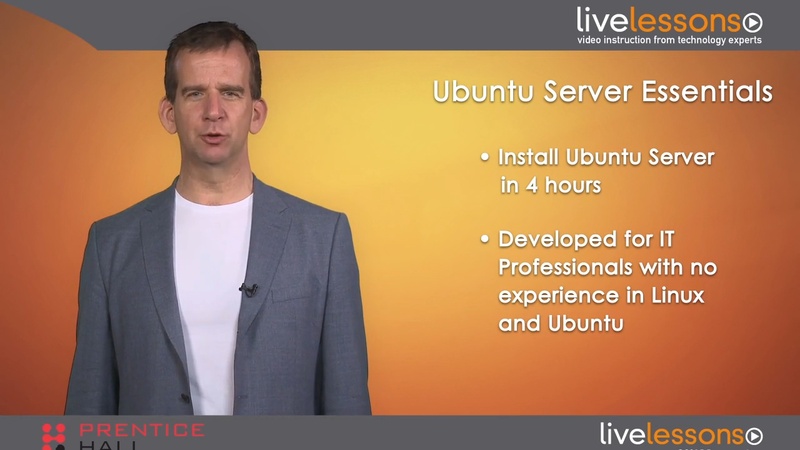 4 hours of video instruction that will get you started with Ubuntu Server, the leading platform for web servers and scale-out computing. Learn everything you need to know to install a fully-operational server in 4 hours. Ubuntu Server Essentials is a unique video product that helps administrators get started with the Ubuntu Linux Server edition. It walks the audience through the first steps that are needed to get a fully operational server environment, focusing on setting up a LAMP Server on Ubuntu. This video course details real-world tasks and provides multimedia tutorials that you can apply to real world scenarios. The target audience for this course includes beginning to intermediate Linux users. Some basic Linux knowledge is suggested, although an in depth or structured Linux background is not required.